Microsoft has unveiled their “most portable and affordable Surface product yet,” with the Surface Go. The Surface Go has a 10-inch PixelSense Display with a resolution of 1800×1200 and 217 PPI and a 3:2 aspect ratio. The display support 4096 levels of pressure sensitivity with the optional Surface Pen. Just like Surface Pro, the Surface Go has a magnesium body with a kickstand that can go up to 165 degrees. There’s also optional Type Cover for the Surface Go, which magnetically attaches like on the Surface Pro and is backlit and has a Precision TrackPad. 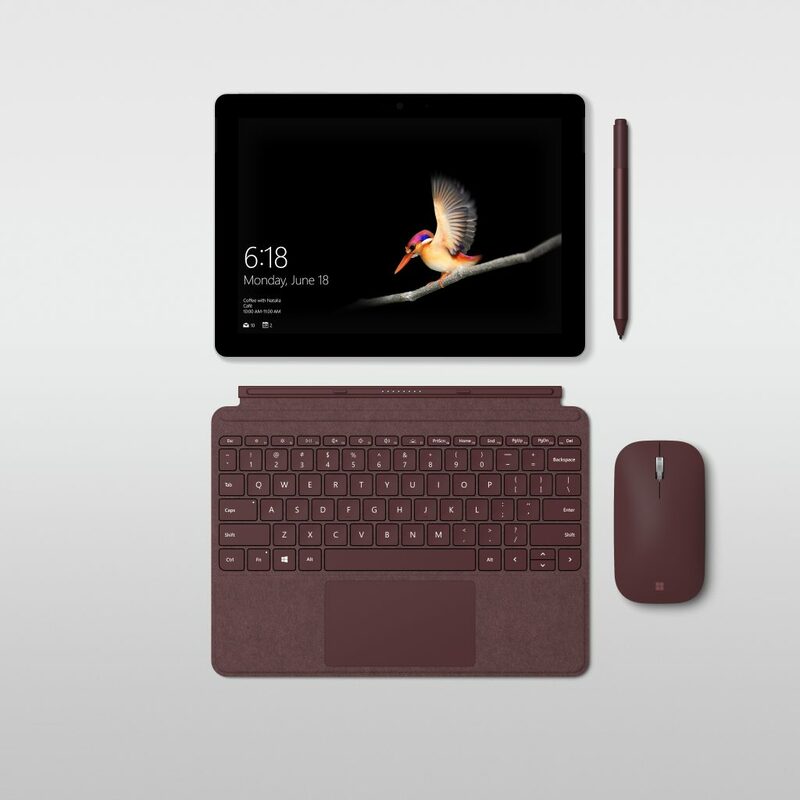 The Surface Go Type Cover comes in three colours, Burgundy, Cobalt Blue, Platinum and black. The Type Covers for the Surface Go costs $128.99 CAD. The Surface Go is also compatible with the Surface Pen (which is also sold separately). Microsoft also announced the Surface Mobile Mouse, which is a “stylish, ultra-thin and affordable” mouse. It has Bluetooth 4.2 and uses Microsoft’s BlueTrack Technology to make it dynamically adaptable to 4000 frames per second and tracking speed up to 30 inches per second. The Surface Mobile Mouse is available in three colours, Burgundy, Cobalt Blue, Platinum and costs $44.99 CAD. It’s powered by the Intel Pentium Gold Processor and has Intel HD Graphics 615. It can be optioned with either 4GB or 8GB of RAM and either 64GB of flash storage or 128GB SSD. The tablet comes with support for Windows Hello face sign-in. You can expect up to 9 hours of battery life, there’s 8-megapixel rear-facing camera and 5-megapixel front-facing camera. Both cameras have support for 1080p HD video. There are also stereo speakers with Dolby Audio Premium. 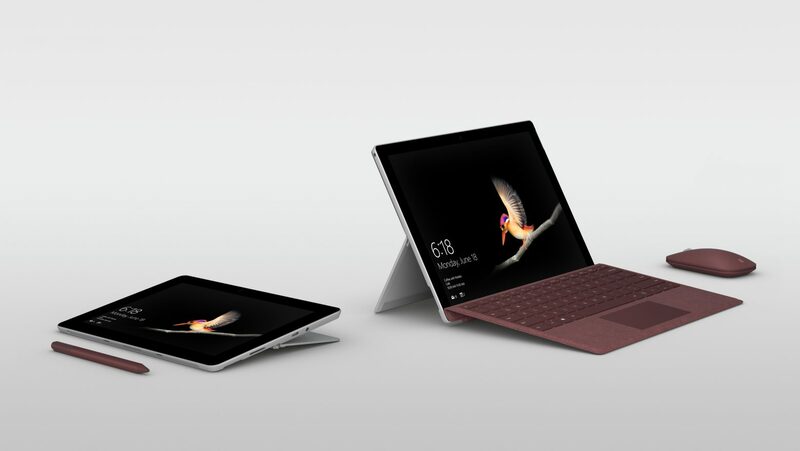 The Surface Go has a USB-C port (which can be used for data, video and charging), a Surface Connect port, microSD card slot and a 3.5mm headphone jack. There’s also volume buttons and a power button. The Surface Go is running Windows 10 Home in S Mode. 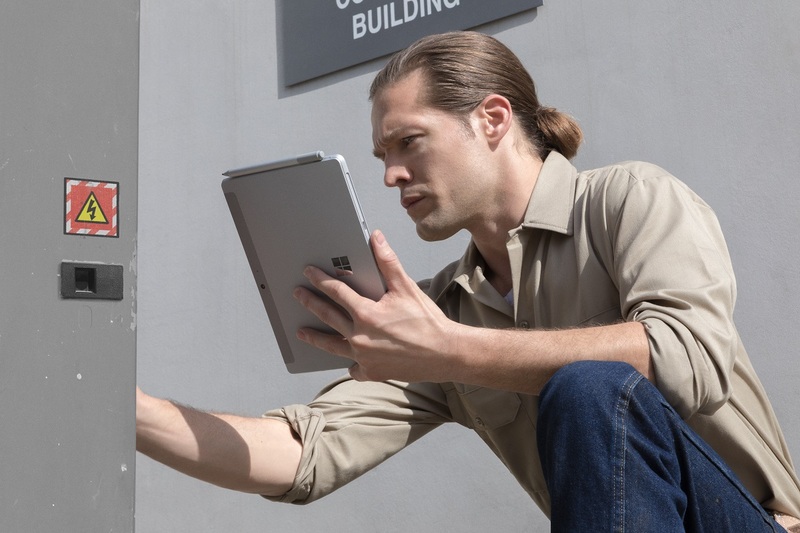 The tablet weighs just 1.15 pounds, making it Microsoft’s lightest and smaller Surface to date. The Surface Go will be available for pre-order in Canada, US, Australia, New Zealand, UK, Ireland, France, Germany, Austria, Belgium, Luxembourg, Netherlands, Switzerland, Denmark, Finland, Norway, Sweden, Poland, Italy and Spain on July 10th. It’ll start shipping in those markets above on August 2nd. The LTE model will be coming later this year. Soon after, it’ll come to Japan, Singapore, Korea, Taiwan, Malaysia, Thailand, Hong Kong and China. The Surface Go starts at $529 CAD ($399 USD). Update – July 10th, 2018: The Surface Go is now available for pre-order from the Microsoft Store. It cost $529 CAD ($399 USD) for the 4GB RAM / 64GB of flash storage or $699 CAD ($549 USD) for the 8GB RAM / 128GB SSD.